Okay, so we're fussy about photos. It's just our thing. You may be very proud of the picture you took--with your cell-phone--of your g1 Optimus Prime with the missing leg propped up against half of a baloney sandwich, but unless the moderator on duty is stinking drunk there's little chance it will be approved for use on the site. But not to worry, by adhering to a few silly little rules you too can learn to take shmax-worthy photos, and we're gonna show you how. We'll start by outlining the basic guidelines, and then finish up with a step-by-step tutorial. Photo must be yours. Don't submit anything you took from eBay, or some other site. There are no precise dimensions to be observed, but in general your photo should be of sufficient resolution for all text to be easily readable (even itty-bitty kanji on Japanese toys), while staying under 1MB in file size. Make sure that the subject of your photo dominantly fills the photo. If you submit a photo that is very large, but the subject is so small that it gets swallowed up by all the negative space, it will be rejected for not being "zoomed-in" enough. So, try zooming-in or moving your camera closer to the subject. If your source photo is high-resolution, you can often correct this simply by cropping a bit tighter before resizing the image. Make sure that all the edges of your subject and its shadow are in-frame. You can crop the photo as tightly as you like, and comfortable white borders will be automatically set by the system software. No substitutions. The photo you submit and the record you're attaching it to must be an exact match. In other words, if you find yourself muttering "well, they want a photo of Henkei Grimlock's missile, but I've got the US version and it's close enough", rap your knuckles with a ruler. Nothing is "close enough"--exact matches only, please. And no knock-offs! We don't ask that the toys you're photographing be in perfect condition, but they should be completely intact. Boxed and carded toys should preferably be sealed, and loose figures and parts should not be visibly broken or missing components (such as a missile-firing lever). Sticker sheets should be unused. Your items should be brightly lit and shot against a featureless, clean white background. When we say "white", we don't mean a white bedspread or a white towel, we mean white, like the background color of this page. Even a subtle greyish tinge in the corners will be grounds for rejection, so be very careful to make sure that your background is pure white. If your photo is rejected but it looks white to you, you may need to turn up your brightness a bit to make the greyish regions visible. See the tutorial section on this page for a discussion of how to achieve a pure white background. Strive for rich, vibrant colors with bold darks and crisp whites. Try to avoid a washed-out look, overblown brightness, or muddy, inky blacks. Shooting white figures, parts, and instruction sheets against a white background can be a challenge, but remember that the pure, rgb(255,255,255) white we expect for the background doesn't actually exist in nature or on your toy, so it should always be possible to achieve enough contrast for the subject to be readable. Photos must be sharply focused. If you're having trouble with blurriness, try experimenting with your camera's macro mode, and you should definitely get a (cheap) tripod. See the tutorial section for more information. Strive for true, balanced colors. Look at your photo, then look at the toy. Do the colors really match? Make sure that your reds, in particular, aren't pinkish, purplish, or overly bright. If you're having trouble, make sure your camera's white balance is correctly set, and that you're lighting the subject only with pure, white light, and that the room's overhead lights are turned off. Photos must be free of obvious compression artifacts. Photoshop users should be able to get away with using a "High" or even "Maximum" quality setting when saving out the final jpg; any lower than that and the visible quality may start to suffer. Try to avoid an overall grainy or mealy texture in your photos. If you're having a lot of trouble with this you may need to check your lighting or experiment with your camera's ISO setting. See the tutorial section for more information on the ISO setting. You're encouraged to replace any existing photo you see that you think you can improve on. The moderator will generally accept your photo if it's at least equal or better than the existing photo unless there's a contest going on, in which case it will only be accepted if it is clearly superior to the existing photo. You can use your camera's exposure setting to burn in the image a bit and adjust for inadequate lighting. When used properly this will make your whites brighter straight out of the camera, but if you overdo it your photos will have a glowy, blown-out look. If that's happening, reduce your exposure setting and compensate with more powerful bulbs. You can also suffer from a washed-out look by going overboard with the brightness and levels controls in your photo editing software. When in doubt, use brighter bulbs! Subject must be brightly lit by pure, white light. Avoid bulbs with a "warm" or yellowish tint to them (the kind in the lamps in your house)--they will tint the subjects of your photos with a yellow glow, and this is very difficult to correct. Some of our members have had good luck with General Electric's "Reveal" line of bulbs. A soft, subtle, smooth shadow adds a lot of class, but we'll reject photos with dark, inky shadows that fight with the subject of the photo for attention. The shadow should fall on the floor, never on the backdrop. The photo should look natural and un-doctored! We shouldn't see jagged or fuzzy edges around the subject, as if you did a lot of fussy work with an eraser tool (or selected the background with Photoshop's magic wand tool with the tolerance set too high and deleted). If you find that you're spending a lot of time with an eraser tool in some graphics program or doing a lot of other micro-manipulations, you are likely doing something wrong. In fact, you'll know that you've reached true Jedi-level mastery when you get to the point where all you're doing in your photo software is cropping, resizing, and giving a quick bump to the levels. Please, no flash. If you have a professional setup and you really know what you're doing then have at it, but otherwise it tends to blow everything out and create a lot of glare. See the tutorial section for a discussion of how to set up your lighting. Package photos should be shot "straight-on"--please try to keep any fancy angles or perspective effects to a minimum. If the subject takes on a significantly trapezoidal shape due to perspective, it will likely be rejected. All text on the package should be readable. We should be able to read the assortment and product numbers if it has them. Feel free to come up with an interesting pose for your figure, but make sure that you provide a clear view of the toy and as much detail as possible, with all extremities (heads, feet and hands) in-frame. For robot mode photos, try to create the illusion that the robot is the same size as you are. Pretend that the camera is your eye, and try to put your "eye" at the figure's eye level. Try to avoid always looking down at your subject. For alternate form, we prefer a simple three-quarters view that provides a good "read" of the overall shape. Some alternate forms, however, such as cassettes, lend themselves better to a straight-on, frontal view, and others, such as T-Rexes, work better with an eye-level view--use your judgment for special cases. Please, don't submit photos of customized toys. Reprolabels are ok, as long as they are exact replicas of the original sticker sheets. Also, please mention in the photo's caption when the shot features Reprolabels. Try to shoot flat parts (such as Cybertron Keys, Energon Chips, or swords) with a distinctive outline "straight-on", minimizing perspective. Missiles should lie horizontally and point to the right. Guns that are left/right symmetrical should lie horizontally and point to the right. For guns that are hollowed-out on one side, put the hollowed-out side down (so that we don't see it). For guns that come in an aysmmetrical pair (meaning there is a left-hand and right-hand version), shoot the gun for the right hand pointing to the right, and the gun for the left hand pointing to the left. Don't worry about trying to unfold instruction sheets and booklets--just shoot them straight-on in their folded-up form. A good tip is to prop them up (you may need to use a tiny piece of tape to keep it from unfolding) against some small object, and shoot them like you would any other toy. You'll create a little much-needed contrast, have an easier time with the lighting, and get a better result straight out of the camera than you would if you were to lay it down flat. When propping things like instruction booklets and tech spec cards, try to minimize any shadow created, particularly in the borders of the photo. As with all flat accessories, tech spec cards should be shot straight-on (prop them up against something for best results), minimizing perspective. Take two photos of each tech spec card, one for the front, and one for the back. Assign the back (the side with the illustration of the character) to the primary photo slot, and the front (the side with the bio info and statistics) to the secondary slot. Only one accessory per photo. If a figure comes with several missiles, only shoot one missile. Taking good photos will require a little preparation, but with the exception of the digital camera you shouldn't need to spend a lot of money and chances are good that you already have a lot of what you need around the house. You'll need to spend some time learning how to use the various tools involved and fine-tuning your technique but once you get in the groove you can work quickly and crank out photos like a champ. Unfortunately, you can't just put some pieces of white paper down on a tabletop and expect to get good results. You can buy a pre-fabricated light tent, or you can see if you can save a few bucks by building your own light box. Which you choose is up to you; the homemade light box has the advantage of being totally customizable to suit your tastes, whereas the light tent wins points by being 100% translucent, which makes lighting it a breeze. The homemade light box will run a bit cheaper, but you can find light tents online now for around $20-$30 (search amazon.com for "light tent"), and you'll save a few hours of tinkering around. Professional product photographers use a device that looks like a camping tent, with all 6 sides being made from a translucent white vinyl material. These pre-fabricated light tents can be bought online, and all have the advantage of being made entirely of translucent material--typically vinyl--and are designed to let light in but not out again. Some of them are outrageously priced--up over $1000--while others hover around the $30-$50 range. Avoid the low-range ones that want to include a light kit; the lights are typically under-powered for what you need to do. Want to build your own? Head down to your local art or office supplies store and pick up a large, sturdy piece of pure white foam core or styrofoam. You'll have to use your own judgment on size--if you're going to be shooting large toys like Omega Supreme or Fortress Maximus you'll need to build a larger box than if you're going to be dealing with smaller toys. There are some boxed toys that are so big that any reasonable photo booth you make isn't going to cut it, but they come along fairly rarely, and can be handled case-by-case with big sheets of poster paper, white sheets, etc. You'll probably want your box to be at least 20" wide, 20" tall, and 15" deep. You can achieve the effect of the light tent with your homemade box by simply leaving the sides and top open and covering them in white fabric, or vinyl. Some of our members use a white sheet, others use a satiny, reflective fabric. Your lights are positioned completely outside the box, and shine in at the scene through the fabric. This serves to diffuse your light, spreading it around more evenly, softening your shadows, and reducing glare. Be careful not to overly mute your lights--if you overdo it the loss of all specular highlight on monochromatic pieces like guns and missiles will make the subtle detail hard to make out. No matter what kind of tent or box you choose, one way or another you have to solve the problem of hiding the little seam that is made where the backdrop joins the floor. A good tip is to tape a long, smooth piece of sturdy paper to the top of your backdrop, and let it run down the backdrop and all the way forward to the front of your box, such that a smooth curve is created. The seam area is typically the hardest part of the box to light, and with this trick you'll not only be removing the need to do any erasing whatsoever, you'll be increasing the brightness of the entire area. A tripod is highly recommended, for a few reasons. First, you'll probably be doing a lot of fiddling with your camera's settings, which means that you'll be moving the camera around between shots. Even a slight change in position can change the feel of the lighting, which means you have to fiddle more, which means you have to move around again, ad infinitum. And if you're shooting a series of toys that are all, say, deluxe class, it's nice to be able to preserve just the right position once you find it. And finally, the most obvious reason to use a tripod is that if you use it in conjunction with your camera's self-timer, your photos will always be in perfect focus. Just the act of pushing down the button can cause a minute jiggle, and even a tiny movement can produce unwanted blurriness. But with the timer you can do completely hands-off shooting, which will result in effortlessly sharp photos, which will impress the girls. You don't have to get some giant, unwieldy thing. If you shoot on a tabletop you can do just fine with one of the miniature tripods. Several of the regular contributors on shmax.com use the Targus Digital Grypton Tripod TG-GP3010. It costs about $10, stands only a few inches off the table, and has flexible legs that can be molded into any position you want, or even wrapped around something. Turn OFF the flash. It will only cause trouble, and you'll be able to achieve a perfect photo without it. Nearly all digital cameras have a macro mode. Look for a menu button with an image of a flower on it. Macro mode switches your camera into a zoomed-in close-up up mode that lets you get very close to small objects (such as mini-cons, missiles, etc). Your camera may have trouble with the focus if you get too close, so you'll have to experiment to find the right balance. If focus is still a problem consider using a tripod and your camera's timer function to achieve hands-off, jitter-free shooting. Your camera may not allow you to tune the aperture setting, but if it does try setting your aperture to a small opening like f-8 or f-11, thereby increasing depth of focus and producing sharper images. Most digital cameras will allow you to compensate for the wide variance in color temperature--and unwanted tinting--of your lighting setup with a function known as "white balance". Some cameras will let you "capture" perfect white balance by holding a white card in front of the lens, and others will let you select from a series of pre-sets (if your camera offers a "Tungsten" or "Incandescant" setting, give it a try). It's absolutely key that you choose the right setting--the wrong one can produce an awful yellowish tone to your photos (the "fluorescent" setting in particular can produce disastrous results when used with certain types of bulbs). Study your manual to learn how to effectively set the white balance! This is an important one. Setting the correct exposure will create a brighter, more colorful photo, compensate for dim lighting, and white-out the background. You'll need to experiment with this setting, but in general the longer the exposure the better. Don't set it too high or your image will appear washed-out. The ISO setting determines how sensitive your camera is to light. A high ISO setting can help when shooting in low light conditions, but it can also result in a grainy, mealy texture in your photos. Assuming that your toy is as brightly lit as possible, you'll want to go for a fairly low value. If you notice graininess in your photos, try lowering the ISO value (try 100 or lower). You'll generally want three lights shining on your subject in addition to whatever ambient lighting is already in the room. The idea is to flood the box with as much light as possible. Really, it's not possible to over-light the box, and the brighter the scene, the less fiddling with exposure settings and post-processing you'll have to do. White toys and instruction sheets are also much easier to shoot when brightly lit. Put your strongest light directly overhead, shining down through the translucent top of your box. You can try angling it so that it points a bit toward the backdrop, completely blasting the greys and shadows out of the box. Be careful not to bring it so far forward that your toys cast long shadows. Put each of your other two lights on the side, down lower, casting even more light onto the floor and helping illuminate the subject. These lights can be of lower wattage than the top light--you don't want them to obliterate any shadows created by the top light. Remember, we'd rather have a nice shadow than none at all. Use the highest wattage bulbs you can find--you really can't go too bright. You'll want a pure, white light. Most of the bulbs you have in the lamps around your house are probably of the "warm" variety, with a slightly reddish-yellow tint to them, and are to be avoided like the plague. You'll do better with a "cool" bulb, preferably with no tint whatsoever, such as the General Electric "Reveal" line of bulbs. The larger your box, the more power you'll need in your bulbs to light it. For a large box, you may want to go as high as 150W to 200W for the top light (though be warned that it can be difficult to find clamp lights that go as high as 200W--most of them top out at 150W), and 75W to 150W for the sides. For smaller boxes, you can get away with much smaller wattages. If you're having trouble producing soft, subtle shadows, we highly recommend putting a layer of gauze, white fabric or nylon between the lights and the subject (don't get it too close to the bulb or it'll burn). In fact, this should factor into the design of your light box; see the section on light box construction in this tutorial for more information. With any luck, your photos should be very close to finished straight out of the camera, but you'll still probably need to take your image into some kind of graphics editing software to fine-tune things. Photoshop is the most commonly used program for this kind of work, but really most packages will have the power to do the simple manipulations needed. Gimp, for example, is a very powerful free program that is ideal for our purposes. Once you've chosen a package there are a variety of techniques for achieving that pure white background. This may be an obvious tip to some, but I'll say it anyway: KEEP YOUR ORIGINALS--at least until your photo has been accepted. Most photos get rejected because of poor post-processing, and you can usually produce a nice photo by going back to the original and trying again. So either leave them in the camera or store them off somewhere safe, and do your processing on copies. Sometimes you'll have a stubborn greyish region in the corners that won't go away without seriously over-blowing the brightness. This is usually a symptom of inefficient lighting or camera settings, but when you need to you can use your program's eraser tool to wipe away the grime. Erasing is something that should be used sparingly. If you find that you're spending more than a few seconds with the eraser on each of your images, chances are good that you need to improve other aspects of your pipeline. When you're really in the zone and your lighting is set up just right and you have the proper camera settings, you don't do any erasing at all. Bring up the levels dialog. 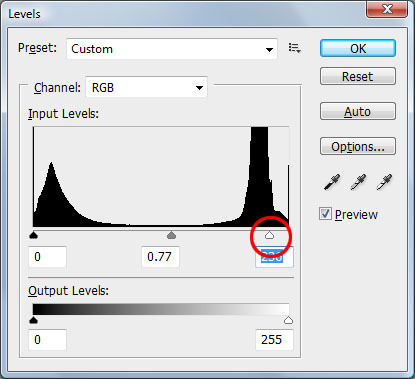 In Photoshop, select "Image > Adjustments > Levels" from the menus. Look for a bar with 3 little arrow controls on it. Drag the one on the right to the left until the background is pure white. If your image looks good, then you're done. But if you had to move the control to the left so much that the subject of the photo started to suffer, then you can correct for that by moving each of the other two little slider controls to the right a bit. Next, draw a rectangular selection around the subject of your photo, making it as tight as you can without cutting out any part of the subject or its shadow, and use your program's "Crop" operation. Don't worry about cropping too tightly--we'll automatically add a comfortable white border back so it will look good on the site. The next step is to reduce the size of your image. Most cameras will output a file that is far too large for you to upload onto the site. Generally, you'll want the longest edge of your photo to be in the range of 800-1000px, or even larger if you can maintain quality in the saving step. In Photoshop, you can resize your image with the "Image > Image Size" dialog. The final step is to save out a jpeg. I recommend that you save your final output images in a different directory than the one you store your originals in--that way you can always go back to the original to change something and re-save a new output image if your photo gets rejected. Save your file as a jpg, and try to choose the highest quality setting you can while staying below 1024k.